City Councilor Pat Davis supports the inclusion of $50m of Small Starts funding for Albuquerque in the federal spending package announced Sunday by congressional negotiators with bipartisan support. 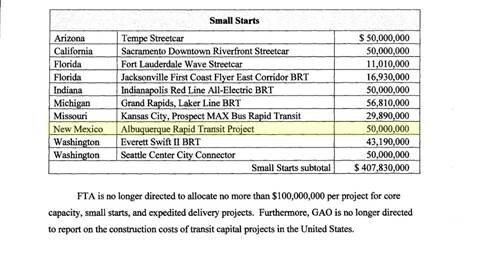 The $50m dollars, included in section K, p 34 of compromise budget bill, is the first allotment of the total $69m awarded to Albuquerque by the Federal Transit Administration for the Albuquerque Rapid Transit (ART) project. ART will be the first phase of a major upgrade to Albuquerque’s public transit system. In another highlight from the budget for Albuquerque, the budget does not include any authorization for the Trump administration to withhold federal funding for cities with immigrant friendly policies such as Albuquerque. In February, City Councilors Klarissa Peña, Isaac Benton, Diane Gibson, and Pat Davis passed a memorial reaffirming Albuquerque’s status as an immigrant friendly city.